Floods in most of the areas are receding but the risks brought on by the adverse weather conditions still remain, the Disaster Management Centre (DMC) said today. DMC Deputy Director and Media Spokesman Pradeep Kodiplly said landslide risks in several districts still remains. The red alert issued in Districts of Kalutara, Galle, Ratnapura, Kegalle and Nuwara Eliya still remain and the people living in these areas should not return to their homes until clearance is given. According to Water levels in Kelani Ganga, Ging Ganga, Nilwala Ganga, Kirindi Oya, Kumbukan Oya, Hada Oya, Mahaweli Ganga, Yan Oya, Malwathu Oya and Maha Oya have receded to a considerable extent. 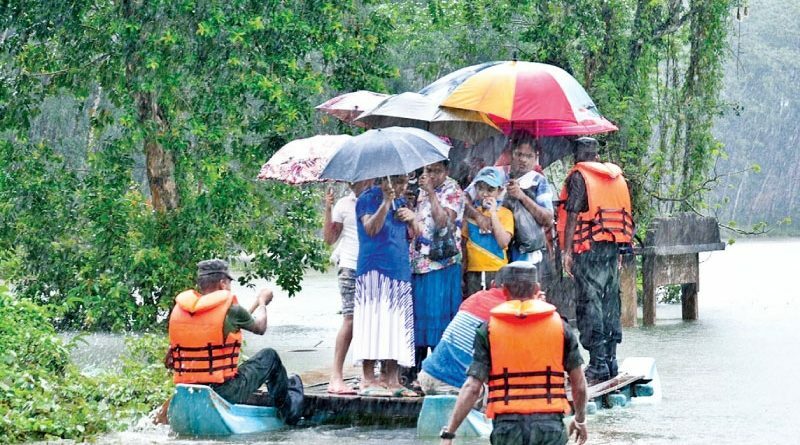 However, floods remains in Millakanda and Patupaula areas in the Kalutara District as the water levels in Kalu Ganga in these areas are yet to go down. Situation was same in Dunamale as water level of Attanagalu Oya was yet to recede. Flood situation remained in Ja-Ela and Madampe and Wennapuwa area in Puttalam District. Some 23 persons have died as a result of adverse weather conditions. Deaths have been caused by lightning, falling of trees and drowning, according to DMC. More than 150,000 were affected by the adverse weather conditions while more than 55, 000 people are still at temporary camps. Meanwhile, the Department of Meteorology said prevailing windy conditions is expected to enhance further in the Western, Southern and South-Eastern sea areas in the coming days. Showers or thundershowers were predicted at times in the sea areas extending from Puttalam to Hambantota via Colombo and Galle. The showers or thundershowers will occur at several places in the other sea areas. Sea area extending from Mannar to Batticaloa via Puttalam, Colombo, Galle and Hambantota was expected to be rough or very rough and could increase up to 60-70kmph at times,” the Department forecast said. Naval and fishing communities were requested to be vigilant in this regard. Rains were expected inland in Western, Sabaragamuwa, Central and Southern Districts. Rainfall of more than 50mm was reported from Colombo, Gampaha, Kalutara and Puttalam Districts.